Home > Community Latest News > What is My Health Record? 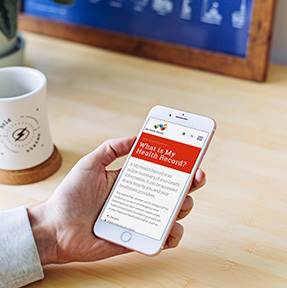 More than six million Australians already have a My Health Record, which is an online summary of their key health information. By the end of 2018, every Australian will be given a My Health Record, unless they choose not to have one set up for them. Your health record can contain a summary of information such as your medications, medical conditions, immunisations, pathology and medical imaging results, as well as a summary of your hospital, specialist, GP and allied health visits. When you have a My Health Record, your health information can be viewed securely online, from anywhere, at any time – even if you move or travel interstate. Your important healthcare information is available in one place and easily accessible by your doctors, specialists or hospitals. Because healthcare providers have better access to clinical information, they have a more detailed picture to make decisions, diagnose and provide treatment. In emergency situations, treating doctors have been able to use My Health Record to provide the appropriate treatment quickly. You don’t need to remember the dates of medical visits, tests, medicine names or dosages and you can add allergy information and advance care plans to your record. It’s your record – you control what information it contains and who can view it. This includes setting up SMS or email notifications to know when a healthcare provider first accesses your record, setting access controls to restrict who can and can’t see your health information, adding personal notes and reviewing your own health information. You can also ask your doctor that some information not be uploaded to your record. Only health professionals involved in your care are authorised to access your record. Heavy penalties apply for inappropriate use. Security is a key design element of the My Health Record system, which adheres to high level Australian Government security requirements. The My Health Record system is protected by legislation which governs the way the system is accessed, managed and used. By the end of this year, all Australians will have a My Health Record created for them. For people that don’t want a My Health Record created, they can opt out by 15 November 2018. For more information visit the website or call the help line on 1800 723 471.